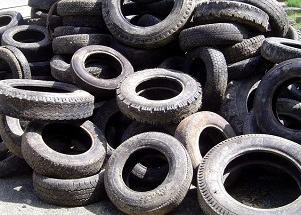 Every year, around a billion scrap tyres reach the end of their useful lives around the world. Many of these end-of-life tyres end up clogging landfills, providing breeding grounds for pests and becoming a threat to the environment. With innovative recycling methods, high-quality tyre shredders and other modern equipment, waste tyres can be turned into new usable materials. Why is end-of-life tyres recovery important? Here are some of the most innovative ways in which end-of-life tyres are being used these days. Crumb rubber – Along with tyre shredding, waste tyres can also be chopped up or ground down to produce crumb rubber. Also known as ground rubber, this is produced by grinding tyres at ambient temperatures or pre-cooling them with liquid nitrogen to produce finer particles during grinding. Today, crumb rubber is used in everything from paving, playgrounds and other surfaces to landfill liners, moulded rubber products, mulch for landscaping and even artificial reefs for marine life. There are few drawbacks while using tire crumbs for making playgrounds. Though no specific chemical hazards from recycled end-of-life tyres in playground surfacing are yet known, it is advised to take a few precautions while playing especially for children such as avoid mouth contact, limit the time of playing in hot days, avoid eating foods in contact with the ground, etc. Still, research is going on chemicals and materials found in tyre crumbs and the exposure scenarios for those who use fields containing tyre crumbs. Civil engineering – Whole, shredded and ground end-of-life tyres provide advantages over other materials for various civil engineering projects. They are lightweight, porous and durable, in addition to offering good insulation, shock absorption and noise reduction. Scrap tyres are commonly used in rubber-modified asphalt, road insulation, running tracks, sports fields, crash barriers, embankments, jetty bumpers, erosion or rainwater runoff control, field drains, backfill for walls, and more. Biofiltering – This is one of the most exciting ways to make use of material recovered from tyres that have reached the end of their useful life. Patented by Dr. Yuefeng Xie, a professional engineer and associate professor of environmental engineering at Penn State Harrisburg, biofiltering wastewater with crumb rubber tackles two issues at the same time. It reduces the problem of waste tyres in landfills and offers an effective solution for treating wastewater, storm water and ship ballast water. Tyre rubber crumbs have been mainly used for absorption purpose. They have been tested chemically for their ability to absorb mercury. In the process ground rubber crumbs remove cadmium from aqueous solutions under predetermined conditions. Moreover, it is used to control hydrogen sulphide content present in waste gases released from industrials plants, waste disposal, wastewater treatment. This biological treatment is developed for effective H2S removal as commonly used chemicals scrubbers had few drawbacks such as high maintenance costs and hazardous chemicals where being used. – Electric arc furnaces – When shredded or whole tyres are applied to scrap metal in steelworks using electric arc furnaces, they help with the conversion of carbon monoxide to carbon dioxide. This technology is already used in the U.S. and Japan, but is also finding industrial applications in Europe. – Devulcanization – Using mechanical, thermal, bacterial and ultrasound processes, the rubber recovered from recycled tyres can be broken down and moulded into new forms. Known as devulcanization, this process is currently costly but ongoing research may help make it more viable in the future. – Pyrolysis – This is another potentially effective way to recover usable material from end-of-life tyres, and relies on the thermal breakdown of organic substances in the absence of air. The technology for this process is currently expensive and facilities are limited, but it may become feasible someday. With the growing push for eco-sustainability around the world, it’s crucial for businesses to do their best with recycling and waste reduction. Reusing and reclaiming end-of-life tyres is one of many solutions we really need to explore! Author Bio: Erich Lawson is very passionate about the environment and is an advocate of effective recycling. He writes on a wide array of topics to inform readers on how modern recycling equipment can be used by industries to reduce monthly wastage bills and increase recycling revenue. You can learn more about environment saving techniques by visiting his blog on Compactor Management Company. I certainly hope that someone has cracked the method of recycling tyres! It’s always a great sign when a tyre retailer has good recycling in place and can get a lot of extra customers this way. I know for us, as we are looking this is an important factor. Keep up the good work!